Kabir | What's with the Climate? What if I said that the floods in Chennai, crazy storm in Sweden, and the upsurges in the Middle East have only one long-time solution? Some might say that this is absurd, but I believe that not being able to see the connections and the systemic loopholes is absurd. Untamed thirst for natural resources, coupled with excessive carbon emissions, has created major crises in many of the economies. It is no surprise that the developing countries and especially Least Developed Countries have most to lose. The developed countries have been built on the colonial past, during which they not only exploited resources of the developing countries, but also left a lasting imprint on the social and ecological systems, in a way that has continued the neocolonial exploitation. Many of the developing countries have been controlled through dictatorial regimes which have been often imposed on them by the west. According to my colleague Peter Riddle, “Whenever we (the Western coalition) have supported a particular group in West Asia to counter another group, that group has become a monster. We supported Israel, and that alienated the whole Arab and Muslim world. We supported the Taliban in Afghanistan to oust the Soviets, and it became Al-Qaeda, which spawned ISIS”. However, the G20, or the group of developed nations refused to take responsibility of the historical debt, at the same time, they continue to misguide the world with the arbitrary figure of the GDP. Do more products and services in the economy mean a better life, improvement in the ecological system? Not necessarily. On the contrary, it could mean more war and increase in destruction of natural resources. No wonder most countries do not want to stop climate change, or stop the oil trade with ISIS, as it affects the GDP of our world. Don’t we all wonder, why are we obsessed with quantifying the GDP, when it has not the relation with the quality of life? In fact, in a survey done by Accenture in Germany and Austria, almost 80 to 90 percent of the respondents said that they wanted a change in the economic system, and almost 67 percent said that they would like to review GDP as the highest goal of the economy. Then what are we waiting for? Currently the leaders from emerging countries like India believe that mitigating climate change is a huge sacrifice for us. President Pranab Mukherjee recently said, “India faces a huge responsibility and challenge in meeting its developmental requirements while remaining committed at the same time to clean energy.” What If there are no contradictions in these goals. What if development goals are only possible with clean energy, with minimal impact on health and environment? Imagine that the new climate target of the COP 21 agreement for limiting global warming to less than 1.5 degrees of warming becomes part of the common good product of nation, making GDP (Gross Domestic Product) irrelevant. An increase in the common good product would mean reducing inequality, reduction in emissions and more jobs. At the corporate level, an increase in the common good balance sheet, would mean fair wages, reduction in emissions of carbon dioxide and no revenue coming from the sales of weapons or on patents of live forms. Our financial return would be the common good return, where investments are creating social impact rather than just blind profit. The founder of the Economy for the Common Good, Christian Felber, says that working for the common good as the highest goal of the economy is nothing new, as most constitutions of democratic countries refer to the same; however this has not been given the attention it deserves. The COP 21 agreement is a historical treaty for us, as 196 countries have committed to the path of climate justice, however the political reality is often shaped by the economic rhetoric of blind growth, without creating the right framework for a transparent market which would promote ethical and sustainable production, and until we turn the economy back to its feet, we will struggle to achieve the climate target, 17 SDGs or even peace in the world. Categories: climate change, climate justice, global warming | Tags: Christian Felber, Economy of Common Good, GDP, Initiatives of Change, ISIS, Islamic State and Climate Change, Peter Riddle, Pranab Mukherjee, Rishab Khanna, War in Middle East and Climate Change | Permalink. Very rarely do we give a thought about the bottle, or that crumpled piece of paper we just tossed into the (sometimes labelled, sometimes not) bin. As a waste manager for the Indigenous Terra Madre, 2015 (3rd to 7th November, 2015), I can say that there is, indeed, a lot that goes beyond the bin. The first three days of the event took place at the Convocation Hall of North East Hill University (NEHU). 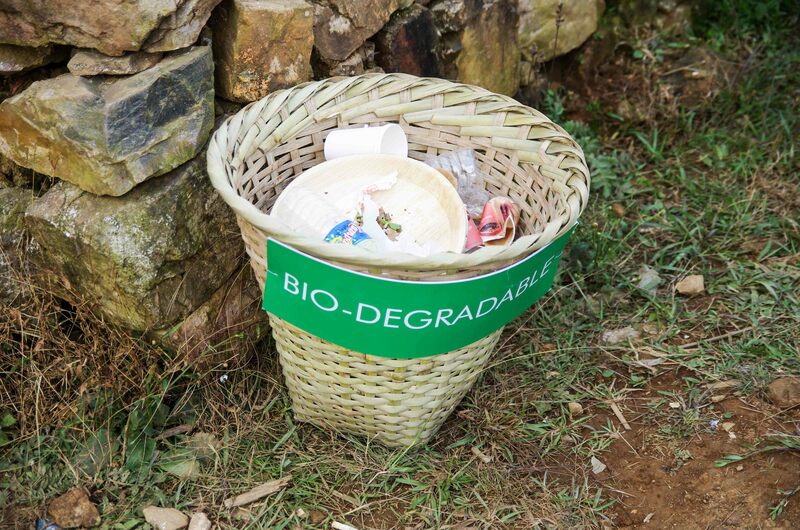 About 120 bins were placed on-site, labelled Biodegradable and Non-biodegrable. They, however failed to serve their purpose initially as their signs were often covered up by oblivious staff while lining with black garbage bags. We managed to remedy that by ensuring that the signs were visible, as well as posting extra signs above the bins, at eye level, categorized into Organic Waste and Inorganics, which was further diverged into Plastic Bottles Only, and Miscellaneous Dry Waste (Plastic bottles excluded). The kitchen and catering staff for the delegate dining hall were duly informed about the disposal arrangements including the segregation of the waste and were made aware of the compost pit (courtesy of Bethany Society, who also supplied us with Garbage2Gold powder for speeding up the composting process) on the grounds for the organic waste. The leftover food from the hall was collected by a third agency, to be used as feed for livestock. 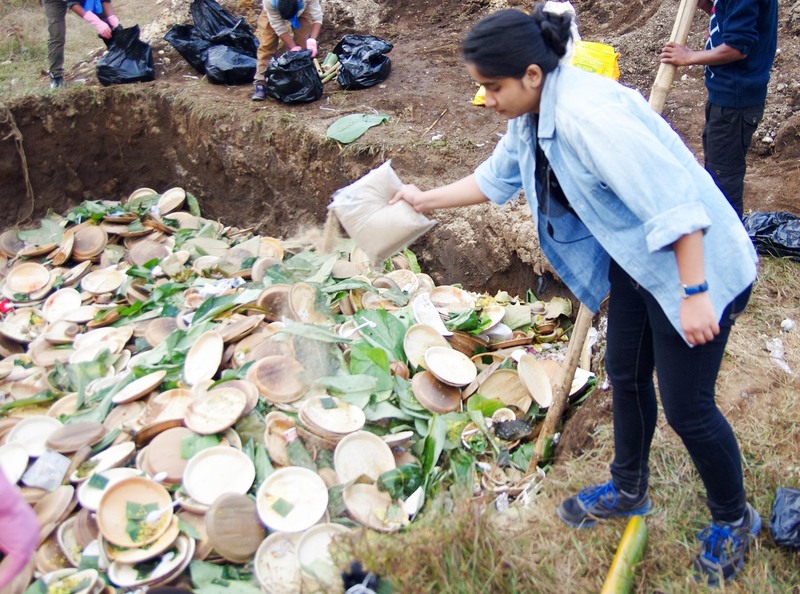 The dry, inorganic waste from around the venue was accumulated at one area, which would be regularly picked up by the Shillong Municipal Board. Upon emptying of the incoming bins, the waste would immediately be separated into separate corners, assigned for plastic bottles (which made up the biggest chunk of the total dry waste amount, as each individual bottle was of a mere 300ml capacity), paper waste, cardboard and assorted metallic waste. The execution at NEHU was fairly organized and uncomplicated, with waste being properly disposed of. The actual food festival took place in Mawphlang, on the 7th of November. Now, managing waste for a food festival is no mean feat, but I (or my teammates, for that matter) certainly wasn’t expecting what awaited us at the site on the day before the main event. The ideal dimensions for a compost pit is ten feet in length, three feet in width and two feet in depth. Despite explicit instructions for at least three pits of the aforementioned dimensions, what greeted us in Mawphlang was a perfectly cubical pit, eight feet cubed, with a layer of water on the bottom. It was neither safe nor feasible as a composting pit. Upon summoning the Event Manager on to the site, he swore in incredulity, wondering if it was supposed to be a compost pit or a water tank. Engaging workers, we got the one third of the depth of the pit filled manually overnight. The stalls were supplied with biodegradable plates made of bark, and forks, spoons and cups made of corn starch. Upon a survey of the thirty six stalls, it was found that none of them were using inorganic materials for serving food. A couple of stalls even took it step further and opted for leaves for plates and leaf spines as spoons. The central challenge in Mawphlang was the sheer number of people. We had at least, if not more, forty thousand people. That’s roughly sixty to eighty thousand plates, from the stall area alone. The ITM Kitchen and the Taste Workshop in the Heritage Village were also having a busy with people coming in constantly. We were short on housekeeping staff as well as the number of bins that filled up repeatedly in a short periods of time. The signs we put up above every single bin failed, as the crowd was so large, no one probably had the patience or the sight to take notice, leading to incoming bags of mixed waste, which had to be separated by (gloved) hand. This difficult task was taken on by the team as well as the local boys hired for the day, in turns. The now-six feet deep pit filled up rapidly, with about a quarter of it left, and about three hours of the event still left. Keeping our fingers crossed and hearts strong, we carried on. The flow gradually thinned, and after sundown, it was no longer possible to continue. We sprinkled G2G dust after every two-three feet. 7th November was coming to an end. And when the party ends, the real work begins. We had to return on the 8th for the final wrap up. The kitchen area of the stalls had left behind huge amounts of organic waste which had to be carried down to the compost pit and ensure there were no (or at least, minimal) inorganic waste mixed in the pile. It went into the 9th, when the SMB turned up in the morning to collect the dry (well, not so dry; after a point, it’s simply impossible to separate anymore) waste. The Pit was closed up with a layer of soil, and a fence put around it to dissuade people from dumping more waste on top, with a sign declaring the presence of fertilizer, which, according to the experts from Bethany Society, would be ready for use in approximately three months. The Event Manager, who I’d come to befriend after discovering we shared a birthday, asked me if I had any parting words for him before they went back to Mumbai. I smiled. Categories: global warming | Tags: North East Hill University, Sanghamitra Nidhi Dutta, Segregating Waste, Terra Madre, waste management in shillong | Permalink. The gathering of countries and civil society at COP 21 at Paris is very focused on creating an outcome which ensures that all the countries of the world agree upon a legally binding arrangement which ensures a strong commitment from all the parties (countries) of the World. However, while there may be exceptions, the reality stands here: key developed countries who are instrumental in ensuring the success of the process are not only shirking their responsibilities but are also working tirelessly to facilitate the creation of a weak agreement which will not accomplish what humanity has set out to accomplish here. Unfortunately the World’s big emitter like the United States of America is also part of this regressive club. Owning up to historic responsibility is key in realizing an equitable agreement which protects the interest of both developed countries as well as developing countries. Common But Differentiated Responsibilities (CBDR) explores the diverse roles that different countries are to take up depending on their capacities and level of development. The true irony lies in the fact that while discussing the language of the text during the debriefs, the CBDR focal points not only talk about how “Developed” countries should take the lead in realizing their commitments but that they only do so in a “voluntary” manner. The fact that obligations are termed voluntary highlights how nations are well on their way to arrive at a hollow compromise. The negotiations so far indicate that the developed nations are not only wriggling out of their historic responsibilities behind closed doors but subsequently present a public picture to the contrary. The French Presidency had promised a very transparent and open process, however the present state of affairs is a far cry from what was promised. Exclusion of civil society observers and closed door bi-lateral consultations go a long way in losing faith in the verity of the process being “transparent”. The details of these discussions and the compromises being arrived at thus not being disclosed appropriately. Parties themselves are complaining about the lack of inclusiveness. Survival of the human race is at stake here. There is no scope of business as usual scenario being the order of the day. It is important for the leaders of the world to converge on an agreement keeping in mind principles of equity, justice and transparency. It is up to the leaders of the world to determine how this event will be remembered in the annals of history. Categories: climate change, climate justice, corruption | Tags: Climate Change Negotiations. French Presidency, COP21 Paris, Transparency in Climate Negotiations | Permalink. It is deeply disappointing and disheartening the way Bombay French Consulate and VFS center in Mumbai conducted their business. Our colleague Ms. Asha Sambhaji Doke- wastepicker (we prefer to call her waste manager) from Aurangabad was supposed to travel with us to Paris for Climate Change negotiations. She was a panelist and supposed to speak in many side events. We applied for visa through VFS center. As she was a delegate – observer in United Nations negotiations, her visa fees was waived. VFS center employees didn’t take care of her file properly, we were told that there is no courier service to Aurangabad, some one has to come and pick up the passport. In first application the consulate refused the visa on two grounds: not sure whether she will come back, not clear how she will sustain herself there. Irrespective of the fact that both to and fro tickets were given with the application, sponsorship letters, accommodation confirmation were all attached. It was decided to apply again. This time we paid the visa fees and to our surprise there was a courier service to Aurangabad. And VFS was happy to deliver the passport. For some reason the center didn’t take Biometrics of Asha. They said they were recorded the previous time. Suddenly out of blues after four days, Consulate asked them to provide the Biometric details. She was asked to come to Mumbai for filing the Biometrics. The misery didn’t end there. The Consulate after having her application for almost a week, near to the travel dates, asked us to submit the Sponsorship letter, copy of a colleague’s visa and audit report of sponsoring organisation again and not through email, hard copies only. We rushed and provided the documents to a colleague who reached Consulate five minutes late and they decided not to receive it. On Friday all the documents were submitted the third time. The departure date was 29th December (we plan to postpone it by two days) we have no idea what’s the status. The consulate also asked us how Asha will survive in France as she doesn’t know English. Our response was that many colleagues from India, Kabir Arora, Mansoor and Pratibha Sharma are traveling with her and there are many translators who have volunteered to help. Her financials were again in question, even after having sponsorship letters. Colleagues from Zero Waste France, Indian Youth Climate Network and WIEGO wrote to consulate, leave aside response, no acknowledgement of email was received. French government is hosting and is the Presidency of the Conference of Parties on Climate Change, instead of being inclusionary in spirit and welcoming to all delegates, they have shown the opposite. It is saddening that we are talking about the poor, who are most vulnerable to climate change, many through their work are actually mitigating it. And the space for them to share their thoughts, experiences and reflections is shrinking. Profile of Asha Sambhaji Doke is given below for reference. 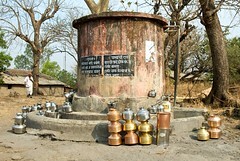 Ashabai Doke: Ashabai Doke is a waste manager and green entrepreneur from Aurangabad, India. She is affiliated to Civic Response Team (CRT^) – an organization based in the same city. As a member of CRT^, Asha manages two recyclable waste shops, and handles over 8 tonnes of material per month. Her efforts contribute to better earnings of over 30 sanitation workers, and more stable livelihoods for three other waste-picker women who are now freed of their bonded labour contracts. She is also the member of Kagad Kach Patra Kashtkari Sanghthana (KKPKS), a trade union, and spokesperson for other persons like her, who made a living from collecting waste materials from dumps. And so, as she travels far and wide, within the country spreading hope to others who dream of earning an honest living; and abroad, at the United Nations Framework Convention on Climate Change -UNFCCC CoP 21 in Paris, to authorities, colleagues, well-wishers and fellow human beings from far and wide on the struggle of one woman to overcome poverty, and to work together for sustainable & equitable Solid Waste Management solutions and a better, cleaner, more just world for all. CRT^ and KKPKS are both coalition member of Alliance of Indian Wastepickers. Categories: climate change, climate justice, global warming | Tags: Visa Rejection of a COP21 delegate | Permalink. It is very apparent that India will have its NAMA (Nationally Appropriate Mitigation Action) in Solid Waste Management and Forestry. NAMA in solid waste management makes sense for many developing countries. The green house gas emissions from waste sector (including waste water) are as low as 3 percent. Considering that most of the cities in developing countries are facing garbage menace, taking an initiative on that front is a win-win for all, for example by providing clean and livable cities plus reducing carbon emissions. Time could not have been this ripe as the newly elected government of Mr. Narendra Modi announced Swachh Bharat Abhiyaan – a Clean India Campaign – after coming to power. The vision is to have open defecation and garbage free India by 2019. Published in Carbon Market Watch newsletter. Categories: climate change, waste management | Tags: Alliance of Indian Wastepickers, Make in India, NAMAs in India, Nationally Appropriate Mitigation Actions, Nationally Appropriate Mitigation Actions in Solid Waste Management, Recycling, Solid Waste Management, Swachh Bharat Abhiyaan, Waste to energy | Permalink.